Sweet potatoes are really underutilized in backyard gardens. They’re so easy to grow, nutritious, and tasty. They’re often overlooked and many believe that the store-bought and homegrown versions are virtually indistinguishable but that couldn’t be farther from the truth. Store-bought sweet potatoes tend to be of a few hardy, orange varieties. While they’re absolutely still delicious there’s so much more variety to be had if you grow your own. Just like other crops there’s sweet potatoes that are better suited to different growing conditions and cooking methods. The classic orange Beauregard is an excellent baker while the white fleshed O’Henry is one of our favorites for mashed potatoes. The Bunch Porto Rico has compact vines better for small gardens while the All Purple is especially hardy. There are also dry and moist varieties. Dry varieties tend to be starchier and are more like regular potatoes. Some people consider them to be more versatile. Moist varieties are often sweeter and usually are the ones you find at the grocery store. Choosing a variety can be tough so it may be wise to try a mix. Southern Exposure has two mixed packages available. Sweet potatoes thrive in loose, well drained soil. If you have heavy soils it’s a good idea to work in a lot of compost and maybe even broad fork your garden bed before planting. To help with drainage you can grow sweet potatoes in raised beds, ridges, or hills. Sweet potatoes also prefer warm temperatures and a relatively long season. Using black plastic mulch to help heat up the soil may be a good idea for those in cooler climates. 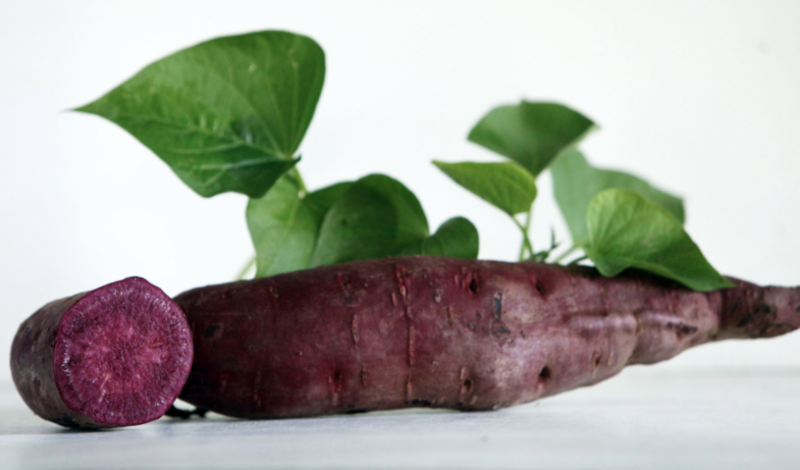 Surprisingly sweet potatoes don’t require especially fertile soil. In fact using chemical fertilizers often leads to tiny potatoes and huge vines. Simply adding some compost before planting is more suitable. Unlike regular potatoes, sweet potatoes cannot be planted using seed potatoes. You need to use slips. Slips are the eyes on sweet potatoes. These are grown and then broken off to be replanted. Note: for information on saving sweet potatoes and growing slips for next year check out our growing guide. Slips should not be planted until 3-4 weeks after your last frost date. They’re very susceptible to frost. They should be planted 2-3 inches deep with their leaves above the soil. The slips you receive may or may not have grown roots already but they’re fine to plant either way. Sweet potatoes have large sprawling vines and require quite a bit of space. You can plant sweet potato slips 10-18 inches apart in rows 3 feet apart. Water them the evening after you plant them and be sure to keep them moist for the next few days as they get established. Sweet potatoes should be mulched soon after planting. If you’re in a warm area where black plastic isn’t required straw or old leaves can be used. This will help keep the soil moist and block out weeds. Until they’re large it’s a good idea to keep them well mulched or weeded occasionally to keep weeds from overtaking them. While sweet potatoes don’t like to be soaked (too much water can cause rotting) they do better with consistent waterings especially in dry areas. Too little water can lead to splitting and poor yields. Sweet potatoes can be affected by a number of pests like sweet potato weevils and diseases. The best way to combat them is purchasing healthy disease free slips, using simple crop rotation, and through maintaining healthy soils. They’re also a favorite of deer so make sure you fence them off or cover them with netting. Aside from the potato itself the sweet potato shoots can also be harvested for cooking greens throughout the season. Just ensure you don’t take too much and kill the plant. Choose a dry, sunny day to harvest your potatoes. It will make both harvesting and curing much easier. Potatoes can be dug whenever they’ve reached an ideal size. It is best to harvest them all before the temperature dips below 55°F. Any lower temperatures can harm their storage capability. Use a garden fork to lift them from the soil before collecting them by hand. Be careful and try to avoid nicking or damaging the potatoes. You may have to search a bit as they can grow up to 1 ft away from the plant itself. Sweet potatoes should be dried before any excess dirt is shaken off. Do not wash them, they don’t store well when washed. For the first 7-10 days they should be kept at about 85°F and 90% humidity to cure. Then they can be stored at about 55°F in a dry, dark, well-ventilated area. Colder temperatures will affect their flavor so don’t refrigerate them until they’ve been cooked. Any sweet potatoes with nicks or bruises will not keep well and should be used up first. You should regularly check you potatoes in storage and remove any bad ones as needed so they don’t spoil the whole crop. Properly cured sweet potatoes stored under the right conditions will keep 5-12 months. If you still have have sweet potatoes in storage from last years garden (or are now craving them) there’s a couple simple ways to cook them even in the summer heat. Unlike in the autumn where I don’t mind baking them and heating up the house, in the spring and summer I typically cook sweet potatoes outside. The simplest method is to clean them, poke a few holes in them, and wrap them whole in tinfoil before popping them onto a grill or into the coals of campfire. Alternatively they can be thinly sliced and wrapped in tinfoil packages with slices of onions, other veggies, and seasonings. All the ingredients should be drizzled in oil oil and the edges of the foil should be rolled or folded tightly to avoid leaking. Then they can be cooked just like the whole potatoes they’ll just cook much quicker. Sweet potatoes truly are a wonderful crop. They’re high in vitamins and their storage ability makes them great for people looking to lessen their dependence on a global food system. It’s not too late to order slips! Try one of our productive varieties in your garden this summer. What’s your favorite sweet potato variety?